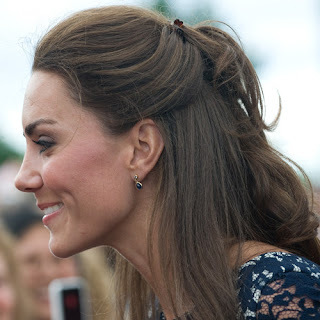 Kate Middleton is a Style icon and she is known for her half up-dos.This id one of her famous half up-do. Steps to get this hair style. Take a small amount of hair in your sideways and from the center close to your forehead. With a rest of your hair make a normal half updo and spray your hairspray to keep that in one place. Take hair from sides and pin that with butterfly clips and place the rest of your hair from the center in between those butterfly clips. Slowly remove the hair band from your ponytail. Stylish half up-do is ready.